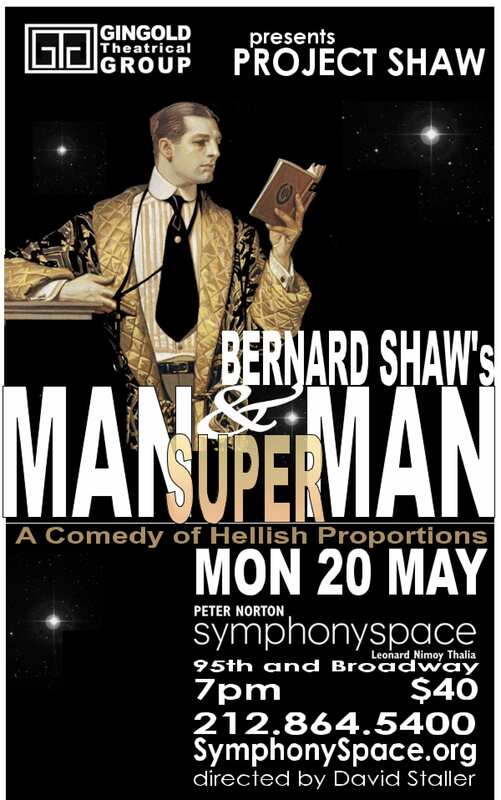 MAN AND SUPERMAN by Bernard Shaw: A comedy of Hellish proportions. Jack, a confirmed bachelor, is determined to keep clear of Ann’s matrimonial designs on him. He flees across continents and even, in the dream act of DON JUAN IN HELL, to Hades for a chat with the Devil and back again to avoid entrapment. But, finally, her intelligent will is too much for him. This incendiary play will be performed complete, though in a substantially cut two hour and forty-five minute version. These script-in-hand all-star readings are always sold out. Each month, Project Shaw brings you either one of Shaw’s scintillating plays or a play by those who shared his ‘art as activism’ view of life. This is the acclaimed staged reading series that has been playing to sold-out crowds for the last 13 years! “Gingold Theatrical Group provides an invaluable — and unique — service to New Yorkers. Not only does it keep topnotch productions of great works of art before the public on a regular basis as no other theater company can, but it also does something less obvious. It keeps the tradition of intelligent argument, embodied in Shaw’s plays but otherwise much lacking from public discourse, alive for those who need it most: the thinking people of a great city.” — Jesse Green, New York Magazine.